Background. Mesh reinforcement has become the standard of care in the repair of open and laparoscopic inguinal hernia repair. Chronic pain after inguinal hernia repair is often due to nerve injury by penetrating mesh fixation devices, such as staples, tacks or sutures. In several studies on hernioplasty, atraumatic mesh fixation with fibrin sealant (FS) proved to be efficient in terms of fixation strength and elasticity. Unfortunately some of these studies have failed to provide a standardized follow up and assessment of the development of chronic pain and the quality of life (QoL). Therefore a randomized controlled trial comparing the FS fixation of mesh with staples (ST) in transabdominal preperitoneal hernioplasty (TAPP) was performed at our department. The primary aim of this study was to assess the postoperative (postOP) pain and quality of life (QoL) with the visual analogue scale (VAS) and the short form 36 (SF 36). Recurrences and the correlation between pre- and postoperative pain with special emphasis on mental factor (ie depressive disorders) as well as the safety of a newly developed spray device with angled tip were secondary aims. Methods. According to the randomization a macroporous mesh (TI-Mesh®, GfE, Germany) was fixed in group A (44 patients with 54 inguinal hernias) with FS (Tisseel®) or with ST (EMS® Stapler) in group B (46 patients with 56 inguinal hernias). The observation period was one year with regular clinical check ups and assessment of VAS and SF 36. Results: TAPP was performed in 110 primary inguinal hernias in 90 patients. One recurrence occurred in each group. At the time of submission of this abstract data evaluation is ongoing. Preliminary data suggest benefical results in group A (FS fixation) in terms of QoL and chronic pain. A possible correlation between pre- and postoperative pain seems likely as well as an impact of impaired mental well being on the perception of pain and QoL after this surgical procedure. 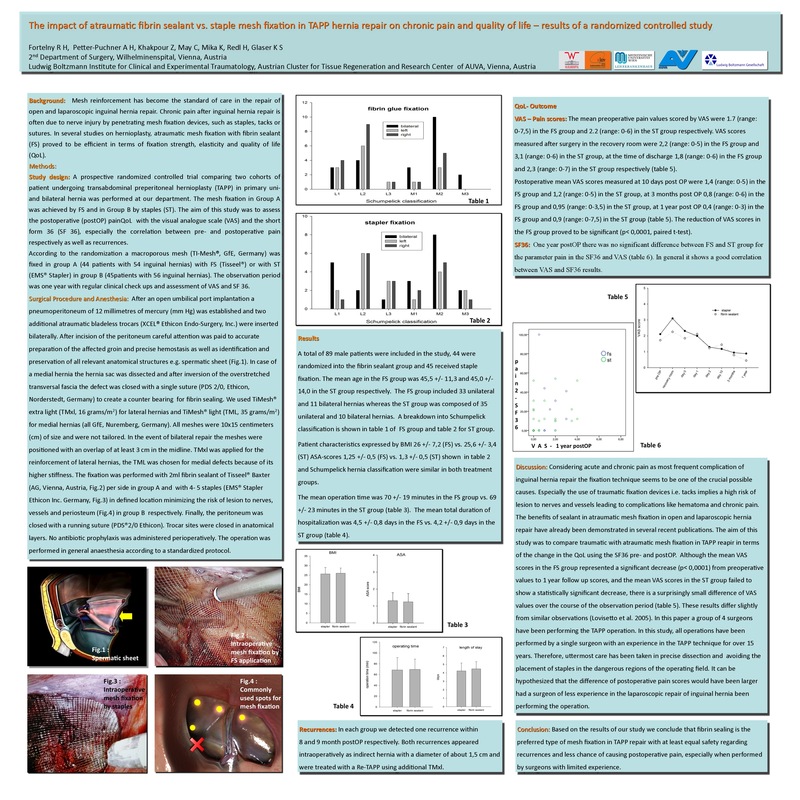 The results of this RTC will be discussed for the first time at the SAGES congress.